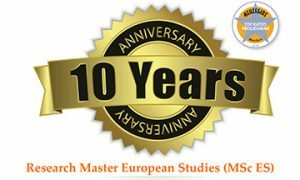 On 29 March, the Research Master European Studies (MSc ES) celebrates its 10th Anniversary. Attend our panels with alumni and academic staff to find out more about the Netherlands’ leading MA programme in European Studies (Keuzegids 2018, 2019). Former students join us from the Centre for European Policy Studies, the Dutch Ministry of Defence, the European Commission and many other professions. Friday 29 March, 14.30 – 17.15, FASoS. Please register. Afterwards the roundtable & discussion with experts ‘Brexit and beyond: Challenges and opportunities for European integration’ takes place.